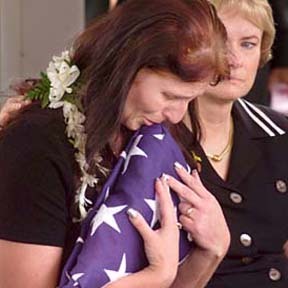 Beate Medina, widow of Staff Sgt. Oscar Medina, kissed the U.S. flag presented to her yesterday at his funeral at the National Memorial Cemetery of the Pacific. With her was Vicki Olson, wife of Maj. Gen. Eric Olson, 25th Infantry Division commander.